This course is designed to help you to transition from being a student to beginning your career as a biotechnician. You will apply the academic and technical competencies that you have learned in the classroom to real world problems. You will also develop the employability skills that will assist you in your chosen field. For many, it is the most exciting time of your ACC experience; the culmination of many hours of hard work as a student and the beginning of many years of satisfying employment. The following is a short check list of items that you must complete prior to enrolling in the course. Complete all your course requirements, prior to the internship. You may co-enroll in one course in your final semester. Perform a degree audit and apply to graduate. Fill in Student Information Sheet on Internship website and give to instructor. Polish your resume. Attend a resume workshop, and send instructor a final PDF copy. Prepare for your interviews. Attend an interview workshop and get ready for your interviews! Start searching for an internship or full time job. You will need to start looking for your internship the semester prior to your internship. See Internship Resources page! Make industry contacts. You are encouraged to attend biotech social events and make contacts. This may include the BioBash, industry partner Tours, biotech club, biotech program workshops & internship poster sessions, industry partner lectures and biotech program celebrations. When can I take the internship course? This course is meant to be a capstone course taken at the end of all of your coursework. Students must have successfully completed the majority of their credit hours before enrolling in BITC 2487. You may be permitted to co-enroll in your final semester with one remaining course; however, you cannot drop this coursework to stay enrolled in BITC2487. Exceptions may be granted and are up to the Biotechnology Department Chair and/or the Instructor. It is important that all your coursework be completed to allow you the best possible internship experience. The required coursework in the Biotechnology Program is designed to prepare you for direct entry into the workforce. Missing any upper level biotechnology coursework will limit your internship opportunities as your internship presents an opportunity to gain work experience in areas you have been trained. For example, you will not be qualified to apply for an internship requiring real time PCR training if you have not already completed BITC2441 where you gain this training. Co-enrolling in multiple courses with your internship is discouraged. Your internship opportunities are limited when you have a restricted schedule due to other course commitments. We recommend enrolling in on-line, night or weekend courses only if a course is necessary for graduation. If multiple courses are needed to graduate consider taking your internship in the following semester. What are my time commitments for this course? This is a full semester course. Hour requirements range from 192-385 hours. We recommend a minimum of 15-20 hrs per week, starting on the first day of class, until the last day of class on the schedule. There is one mandatory in-person class meeting in the first week of class. During this meeting the instructor will review the manual, assignments, and policies for the course. You are required to give a department-wide presentation discussing your internship experience and attend the internship presentations for the class. There are small weekly discussion board assignments and a final paper summarizing your internship experience. Can I perform more than one internship? It is recommended that you focus your attention on ONE internship experience. This is particularly important if you have other course commitments, personal commitments or job commitments. It is required you perform 20-40hrs/week on ONE internship experience for a full semester. If you have no other commitments you may take on an additional non-conflicting internship (20hr each internship). This is with instructor permission only. The goal is for you to have one solid, cohesive internship experience. Finding an internship is ultimately your responsibility. It will be important you take an active role in finding an internship you like. Best internships, and paid internships usually are the first to fill, and are filled prior to the semester starting. You will begin by consulting with your ACC instructor the SEMESTER PRIOR your internship to review your resume for submission to our industry, governmental, and academic partners who have positions available for interns. Internship opening are advertised on the Biotechnology Program student list serve. You will be required to send your cover letter and resume to the industry partners directly. Note, we are not a placement service, although we invest a lot of time in helping you find the internship that meets your needs. Can I use a full time job as my internship? Yes! You may use a full time job as an internship. We encourage our students to seek full time employment! What happens if the internship arrangement does not work out? In rare instances, the internship arrangement may not be working out for you or for the company. If this occurs, first talk to your lab supervisor and discuss your problems with them directly. Often something can be worked out so that you can successfully complete your internship within the company. If you do not get a satisfactory resolution or you are unable to discuss this issue with your lab supervisor, be sure to discuss this with the ACC faculty advisor. You may not quit your internship without talking to your instructor first. And if you ever feel unsafe in your internship be sure to contact your faculty advisor immediately. Your safety is of paramount importance at all times. Can I end my internship after 192 hours? No, this is a whole semester course, and commitment to an industry partner. You must meet the commitment outlined in your acceptance email – the start, end date, hours worked. If you want to change that you must notify your instructor first, then negotiate that with the internship mentor. Everything must be documented on email. It is in your best interest to work as many hours for the entire semester to get the most out of this very valuable opportunity. Yes! You will be graded on your performance as indicated below. This will include not just your internship evaluations but your homework assignments, weekly internship attendance logs, notebook, and your final report and presentation. The grades and evaluations that you receive will be very important as you prepare to obtain a job as a biotechnician. Your interning company is under no obligation to hire you, but the letters of recommendation you receive will go a long way to help you obtain a permanent full time position in this field. Looking for an internship or full-time job? See some of the resources we have for you on the Internship & Career Resources page. Looking for a Biotech internship or job? Our Internship & Job Opportunities page is designed to assist students with finding employment. 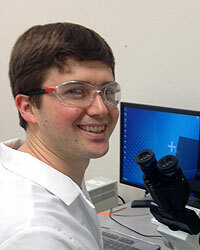 Kevin Strickland returned to school in 2013 to pursue a career in life-sciences. He quickly found a home in ACC's Biotechnology Program. "I wouldn't be where I am today if it weren't for ACC," Kevin said. "The professors have all helped opened so many doors for me and led to lifelong connections."